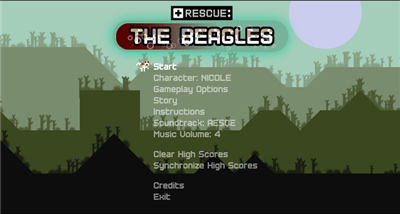 Rescue The Beagles (7.8mb made by 16x16, no install .zip) is a great little retro platformer in 8bit style. Fullscreen or windowed mode with 2 playable characters and a couple of game soundtracks will have you flash backing the the 80's. 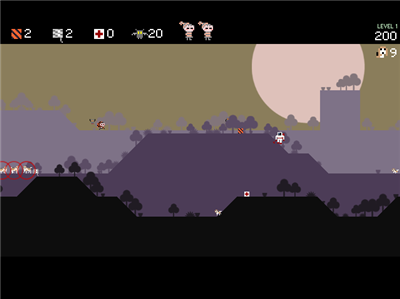 With it's smooth, quick gameplay and side scrolling screen, you will frantically start collecting items/animals, while, running, climbing and parachuting your way to a high score. A pleasure to play even though I wasn't very good at it. 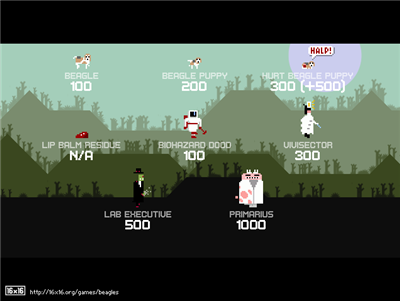 You will definitely need practice with this freeware game to achieve any decent scores. This game will take practice. One little tip, don't drop down to another level of too greater distance or you Will die. 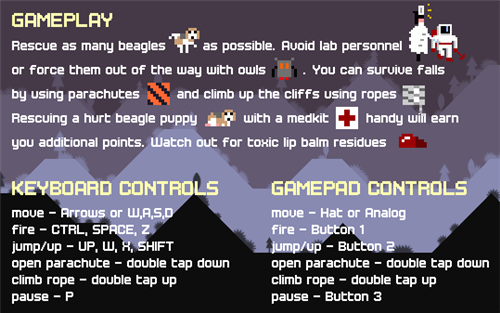 Collect as many ropes and parachutes as possible. - gamepad support, for both; hat and analog joystick. - Placid Flow Bonus - a new type of bonus you earn at the end of each level if you don’t harm anybody on the level. It’s well worth going for as it rewards you with +200% of the total level score. - bigger HUD option (which is on by default). 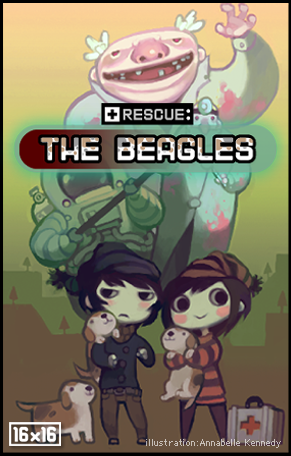 - option to mark soon-to-be-lost beagles with flashing red circles, for people who have trouble spotting a beagle. 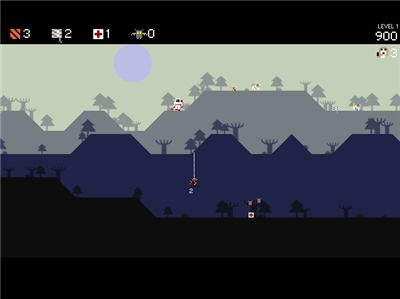 - parachute backpack and rope are now visible on player avatar to indicate the particular resource is available.